It’s been over a year since we introduced Microsoft 365, the complete, intelligent, and secure solution that empowers employees to drive their organizations to future growth. Customers are seeking to transform and support a workforce that is more diverse and mobile than ever before, and they are relying on latest advancements in technology to do so. Customers such as Goodyear, Eli Lilly, and Fruit of the Loom use Microsoft 365 to empower their employees. Microsoft 365 is growing quickly, built on the strength of more than 135 million commercial monthly Office 365 users. Windows 10 has approximately 200 million commercial devices in use, and there is an install base of over 82 million for Enterprise Mobility + Security (EMS). Today, at the Microsoft Ignite Conference in Orlando, Florida, we are introducing new capabilities in Microsoft 365 that make it possible for every person to do their best work. After less than two years in market, more than 329,000 organizations worldwide use Microsoft Teams, including 87 of the Fortune 100 companies. In fact, 54 customers now have more than 10,000 active users of Teams, and Accenture just crossed the 100,000 active-user mark in Teams. Further growth has been spurred by the recently announced free version of Teams. We continue to add powerful new capabilities to foster teamwork and collaboration. New artificial intelligence (AI) powered meeting features are now generally available—including background blur and meeting recording. Background blur uses facial detection to blur your background during video meetings, and meeting recording allows you to playback recorded meeting content at any time with captions and a searchable, timecoded transcript. General availability of new live event capabilities will begin to roll out worldwide in Microsoft 365 later this year. These new tools allow customers to create and stream live and on-demand events in Teams, Yammer and Microsoft Stream to inform and engage customers and employees, wherever they are. Beginning in October, employees can watch videos on the go with the Stream mobile app for iOS and Android, with support for offline viewing. And we’re working with our ecosystem of device partners to deliver new devices optimized for Teams meetings and calling, including the new Surface Hub 2. Surface Hub 2 is perfect for dynamic teamwork and features a light, sleek, and intelligent design that’s easy to move around and fit in any workspace. The first phase of Surface Hub 2, Surface Hub 2 S, will start shipping in the second quarter of 2019. We are extending the power of Teams with new experiences that are tailored to industry-specific and role-based workflows. For example, new capabilities in Teams help empower Firstline Workers to do their best work. 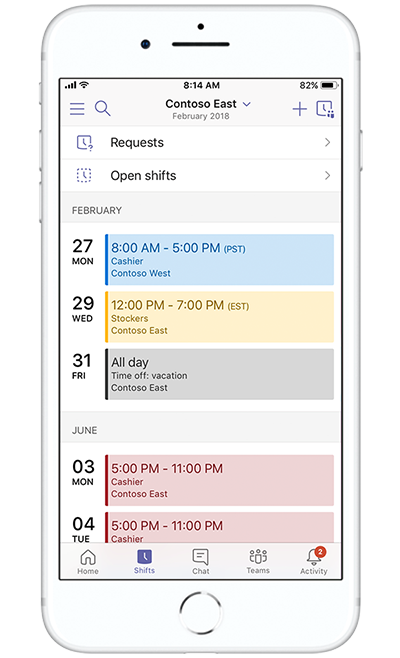 With new schedule management tools, managers can now create and share schedules, and employees can easily swap shifts, request time off, and see who else is working as well as important announcements. These new features will now be available in November. As an example of how Teams can enable secure workflows for regulated industries, we’re delivering a new care coordination solution, now available in private preview, that gives healthcare teams a secure hub for coordinating care across multiple patients. It provides for integration with electronic health records (EHR) systems and enables care providers to communicate about patient care in real-time within Teams’ secure platform. We are also releasing two new secure messaging features with particular relevance in healthcare settings—image annotation, now generally available, and priority notifications, which will roll out by the end of this year to all Teams commercial customers. These capabilities support HIPAA compliance and enable doctors, nurses, and other clinicians to communicate about patients while avoiding the privacy risks that arise when healthcare professionals use consumer chat apps. Easily swap shifts, request time off, and see who else is working. 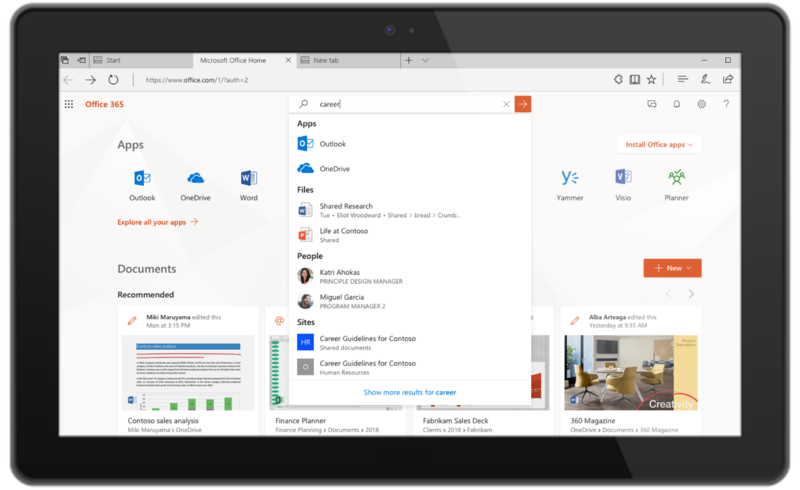 Microsoft Search, a new cohesive search capability, makes it easier for you to find what you need without leaving the flow of your work. We’re putting the search box in a consistent, prominent place across Edge, Bing, Windows, and Office apps, so that search is always one click away. We’re also supercharging the search box so you can not only quickly find people and related content, but you can also access commands for apps and navigate to other content wherever you need to get work done—even before you start typing in the search box. Recognizing that you work in an ecosystem of information, we’re extending Microsoft Search to connect across your organization’s data, inside and outside of Microsoft 365. Learning from your everyday work patterns and acting as a brain for your organization, the Microsoft Graph personalizes your experiences everywhere. We’re pulling together the power of the Microsoft Graph and AI technology from Bing to deliver future experiences that are more relevant to what you are working on. This will include automatically answering questions such as “Can I bring my wife and kids on a work trip?” by using machine reading comprehension that takes knowledge of the world and pairs it with understanding of your organization’s documents. Preview the Microsoft Search capability it as it rolls out to Office.com, Bing.com, and in the SharePoint mobile app today, with many more experiences to come in Edge, Windows, and Office. Find what you need faster with Microsoft Search. Three new features in Microsoft 365 use the power of AI to help you create content that shines. Ideas is a new feature that follows along as you create a document and makes intelligent suggestions. In PowerPoint, Ideas recommends designs, layouts, and images. In Excel, Ideas recognizes trends, suggests charts, and identifies outliers in your data. Ideas will be generally available in Excel soon and will also begin rolling out in preview to the other apps starting with PowerPoint Online. Additionally, new data types in Excel turn references to stocks and geographies into rich entities that can be used to build powerful, interactive spreadsheets. The Stocks and Geography data types—generally available soon—make it easy to get updated stock prices, company information, population, area, and more. Finally, new image recognition capabilities in Excel take a picture of a hand-drawn or printed data table and turn it into an Excel spreadsheet, making data entry as easy as taking a picture. In PowerPoint, Ideas recommends designs, layouts, and images for your presentation. 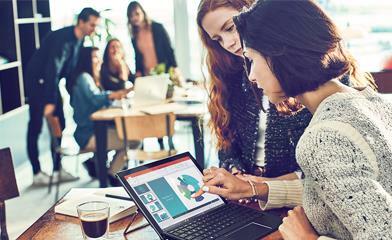 Office empowers everyone to achieve more on any device. And Office loves the Mac. We’re committed to the Mac as a first-class endpoint and have made significant investments in the platform over the past year—including moving the Mac and Windows versions of the apps onto a single code base and releasing new features for the Mac every month. We also tailored new experiences for the Mac, like the new Touch Bar integration. Today, we’re announcing OneDrive Files On-Demand for Mac, a way to access all your personal and work files from the cloud in Finder without using storage space and only download them when you need them. 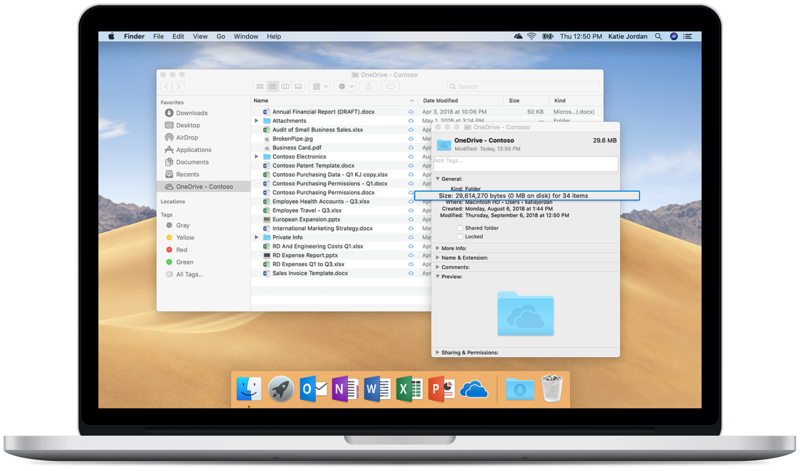 Files On-Demand gives the Mac an intelligent connection to the cloud and is just one more example of the power of Office on the Mac platform. Preview it before it rolls out to all Mac users. OneDrive Files On-Demand for Mac displays all your OneDrive files in Finder but only downloads them when you need them. We’re announcing two new ways to use the power of the LinkedIn network within your daily workflow. Soon, when you connect your LinkedIn account to Office 365, you’ll be able to coauthor documents with people in your LinkedIn network in Word, Excel, and PowerPoint and send emails to them directly from Outlook. This brings your corporate directory and your LinkedIn network together, so you never lose touch with the contacts who can help you succeed, inside or outside your organization. You’ll also see LinkedIn highlights about the people in your meeting invites, providing you with insights about attendees, so you can prep for important meetings quickly and easily. These features help you focus on what’s important by providing information and connections directly in your flow of work and will be coming soon in a staged rollout. For many companies, the specific needs of their business demand a virtualized desktop experience. Today, we are introducing Windows Virtual Desktop, the only cloud-based service that delivers a multi-user Windows 10 experience, which is optimized for Office 365 ProPlus and includes free Windows 7 Extended Security Updates. With Windows Virtual Desktop, you can deploy and scale Windows and Office on Azure in minutes with built-in security and compliance. Sign up to be notified of the preview availability. Following our recent release of the new Microsoft 365 admin center, we’re announcing new features to help you to monitor and manage applications, services, data, devices, and users across your Microsoft 365 subscriptions, including Office 365, Windows 10, and EMS. The Microsoft 365 admin center has several new capabilities to help you better manage your environment, including insight-based recommendations, a more consistent UI, and customized views for each of your admins. The public preview of these features is rolling out now to targeted release admins and soon to all admins. To get started, visit admin.microsoft.com. 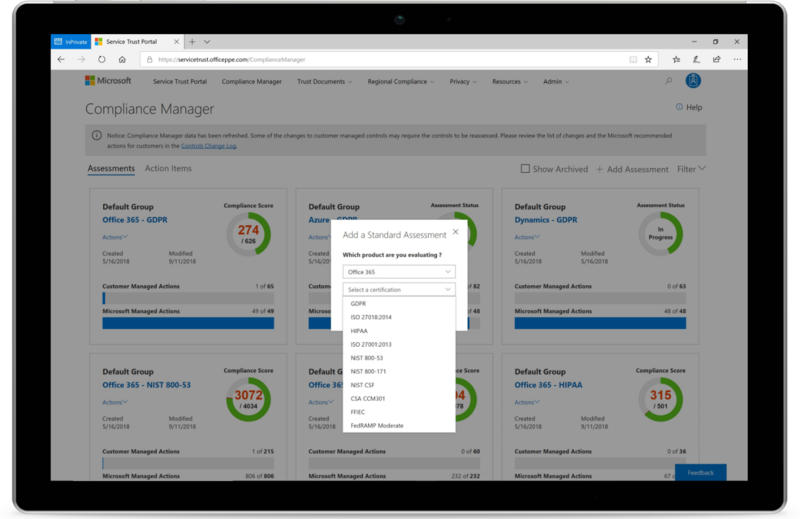 Manage your environment more easily with the Microsoft 365 admin center. In the world of complex regulations and evolving privacy standards, customers consistently tell us they need the built-in, intelligent capabilities of Microsoft 365 to proactively achieve compliance in their organizations. We’ve expanded Compliance Manager to now include 12 assessments across different industries. The unified labeling experience is also now available in the Security & Compliance Center as a single destination where you can create, configure, and automatically apply policies to ensure protection and governance of sensitive data. Compliance Manager now includes 12 assessments across different industries. The work we do in security at Microsoft gives us the broadest perspective on the challenges and a unique ability to help. We focus on three areas: running security operations that work for you, building enterprise-class technology, and driving partnerships for a heterogeneous world. Today, we’re announcing several new enterprise-class capabilities that leverage the Microsoft intelligent cloud and operational learnings to help organizations secure their people, devices, and data. New support for passwordless sign-in via the Microsoft Authenticator app is now available for the hundreds of thousands of Azure Active Directory connected apps that businesses use every day. Nearly all data loss starts with compromised passwords. Today, we are declaring an end to the era of passwords. No company lets enterprises eliminate more passwords than Microsoft. 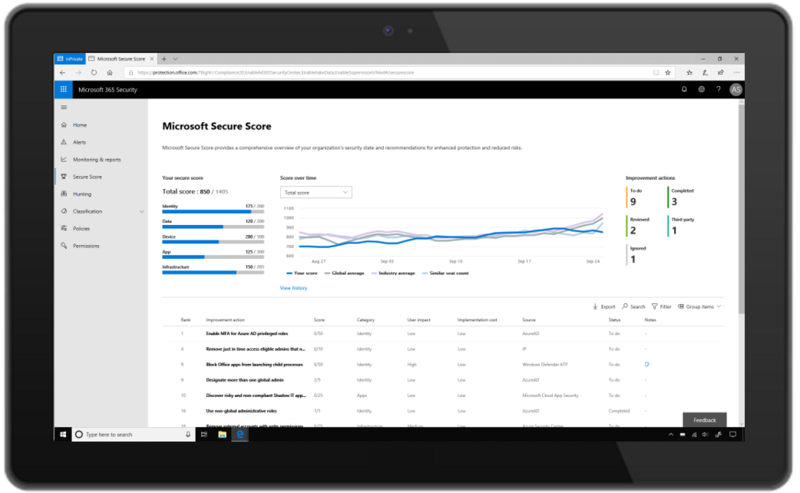 Microsoft Secure Score is the only enterprise-class dynamic report card for cybersecurity. By using it, organizations get assessments and recommendations that typically reduce their chance of a breach by 30-fold. It guides you to take steps like securing admin accounts with Multi-Factor Authentication (MFA), securing users accounts with MFA, and turning off client-side email forwarding rules. Starting today, we’re expanding Secure Score to cover all of Microsoft 365. We are also introducing Secure Score for your hybrid cloud workloads in the Azure Security Center, so you have full visibility across your estate. 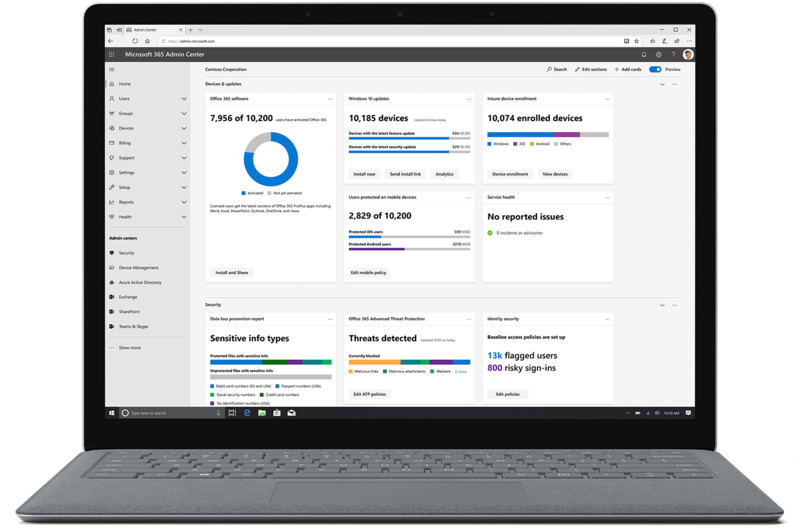 Finally, we are announcing Microsoft Threat Protection, an integrated experience for detection, investigation, and remediation across endpoints, email, documents, identity, and infrastructure in the Microsoft 365 admin console. This will save analysts thousands of hours as they automate the more mundane security tasks. Microsoft Secure Score is expanding to cover all of Microsoft 365. We look forward to bringing you these new ways to achieve more from unlocking creativity to advancing security. You can learn more about our announcements, see all of our Microsoft Ignite sessions live streaming or on-demand, and connect with experts on the Microsoft Tech Community. This post was edited with updated information on the availability of Ideas and new data types in Excel. This post was edited with updated information on the availability of new features in Teams.